Last week, I attended the Ravello Blogger’s Day at Redwood City, along with many other fellow vExpert bloggers. When I received the invite for it, I had to say yes as I was/am a big fan of the technology, given its potential and the many problems it can solve. Also, I was intrigued to see what happened, after its acquisition by Oracle as everything had gone quiet since then. This was a day of mainly two parts: Oracle Cloud and Ravello. I’ll use that as an excuse to divide my post into two, as there is a fair amount to say and it will become too long otherwise. As the title suggests, this one is all about the Oracle Cloud. This part was wholly dealt with by Clay Magouyrk, VP, Oracle Cloud Infrastructure. He started by asking how many of us knew about Oracle Cloud and only a couple of hands went up. That’s not surprising though as it didn’t seem like Oracle’s focus up until now, has been on the public cloud. So, he started by explaining the history of how Oracle organically moved from SaaS to PaaS and then finally to IaaS, all due to demands from their customers. The first generation cloud served their customers well but there were certain limitations, which they wanted to address in their “Second Generation Cloud Infrastructure”. The goals here are to take what works best but also make it “Enterprise Ready”. This means keeping it developer-friendly, agile, pay-as-you-go, self-service etc. but have the enterprise requirements e.g. security, governance, reliability and SLAs etc. met at the same time too. That said, being a “Me too!” cloud provider wasn’t going to be enough so there has to be something unique to offer and there certainly is. Oracle also has “Cloud Regions” and “Availability Domains” in the same way as in AWS. However, what they’re promising is “High Scale, High Performance Physical Network” within an availability domain (or “AD” as they call it – not to be confused with Microsoft’s Active Directory), using a non-oversubscribed Clos Network. It’s a fast, flat physical network which should deliver <100μs latency between hosts and roughly 1 million network post in an AD. In addition to that, Oracle cloud offers private overlay networks that the customers manage themselves, enabling customers to move any workload to the Oracle Cloud, without worrying about networking complexities. That combined with the network performance on offer, should alleviate the networking concerns when it comes to migration to the cloud. 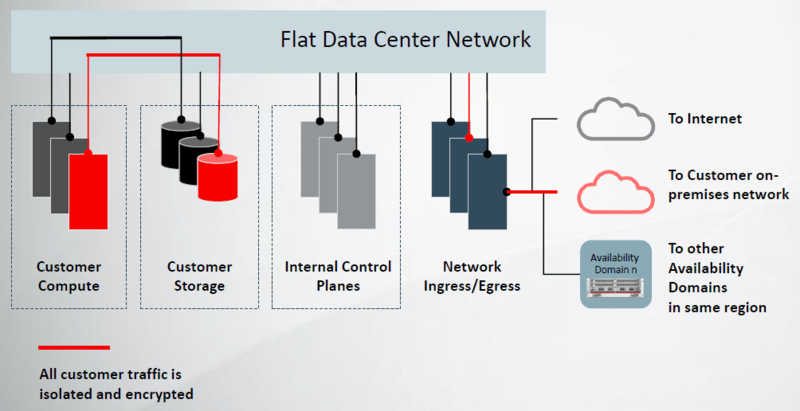 So, you can have all your workloads in Oracle Cloud on a flat network, with isolated and encrypted traffic between them, connected to your on-premises network seamlessly and controlled by you. By the way, we’re not talking just your Cloud Native/General Purpose workloads, but also storage or even bare-metal hosts, which obviously makes for some very interesting possibilities. Oracle’s Bare Metal cloud offering is boasting provisioning speeds to be 4 minutes for a bare metal server and 45 seconds for a VM. It starts with one resource and can scale up to N hosts within minutes and also scale-down anytime. Automation is orchestrated using Terraform and all resources are available via APIs, SDKs and from the console itself. In terms of security, there is physical isolation on the server and there is zero trust between host and the network. The control plane is also in island networks so unreachable from outside. Plus, the usual NACLs, anti-spoofing mechanisms and auditing of API access etc. are also available. With that, bare metal makes it easier to transfer the performance-hungry or difficult to convert systems to the cloud and run them alongside the other workloads with all the desired bandwidth and elasticity at your disposal. I think the biggest hurdle in organisations moving to the cloud is that “Lift and Shift” isn’t really that simple. Unless the application has been built for the cloud, it doesn’t really fit nicely with what’s available in that particular cloud environment. Not only the hypervisor technology is different but networking behaviour and rules are also very different to what they are in a private cloud environment. That makes any migration challenging and is typically the reason why most migrations take ages to become reality. The goal for Oracle Cloud here seems to provide customers with an option to just move whichever workload they think appropriate to the cloud, without having to go through all that conversion. So, what else is different about Oracle Cloud? Well, you would expect it to be “The Best Cloud for Oracle Database”, wouldn’t you? It gets placed into your private cloud network, next to your workloads and can have whichever performance level you require. A single Oracle database node can exceed 200,000 TPS in that environment and there are high availability options also available. You can also have your on-premises database ported to the cloud on high-performance bare metal compute hosts, with full root access. It goes without saying that Ravello also brings a lot to the party and I’ll go into a bit more detail in the following post. Oracle Cloud enables Ravello to do performance improvements that it wasn’t able to take advantage of in the past, while running on other cloud environments. In return, Ravello makes Oracle Cloud able to host a much more diverse set of applications and that’s great for customers. In other words: They are a perfect fit for each other. Pricing is also an aspect where Oracle is aiming to be different. It offers “Simplified Pricing” where the aim is to reduce the number of ways in which customers can be charged for various resources but also there’s also this “Monthly Commit” pricing option, which allows committing to a particular monthly amount of services in exchange for a discounted price. This allows the customers to get more bang for their buck but allows them to budget more predictably if the workload is fairly well-known. That said, I am not too sure if this really is a distinguishing factor as pricing and their models change all the time and we may well see similar models introduced by other vendors too as no doubt, their customers will be asking for similar pricing too. Oracle Cloud offering does contain some compelling features but there are some hurdles that I can see which may slow down the speed of adoption. First is the issue of trust. Oracle has made a great start by engaging with the technical groups and more of that is required as I am sure, like us, many will not be aware of exactly what’s on offer here. However, it will also need to form partnerships with other vendors so that there are no contractual/licensing issues and the offering remains commercially viable for customers. Secondly, geographic coverage of Oracle Cloud is not as wide as some of the rival services, as it stands. I am sure work is continuing to correct that but this should be accelerated with published road map as customers will need to be confident about its availability in all popular regions, for data locality, availability and compliance reasons. I must say I learnt a lot about the Oracle Cloud offering from these sessions by Clay and it seems they’ve put a lot of thought, effort and commitment into this offering. According to him, they’ve gone from nothing to almost 900 people in a space of three years and that shows how serious Oracle is about getting their cloud right, in the face of all the competition. In addition, the integration of Ravello with the platform, does indeed offer something significantly different to other providers. Kudos to Clay for the way he tackled the tough audience (we are a sceptical bunch and did ask many awkward questions) and absorbed all the licensing/support jokes with ease and yet explained the whole offering with passion, which kept us all very interested even towards the end. Full credit to his style of presenting and engaging with the audience. In conclusion, I think it was a very successful part of the day and I feel that all present walked away with a feeling of knowing what Oracle Cloud is about and that it’s a different Oracle that we’re seeing now, which is prepared to hear what others have to say and engaging with the needs of everyone and not just their immediate customers. Second Post: Oracle Ravello Blogger Day – Part 2: Ravello is available now.